Medications that contain the chemical compound salicylate are used as analgesic and anti-inflammatory agents. The wide availability of this ingredient puts a lot of people at risk for an overdose in salicylates [1, 2]. The compound salicylate came from plants and is a main ingredient of several pain-relieving drugs. Two of the most famous forms of salicylates are aspirin and the oil of wintergreen. Salicylates are classified as Nonsteroidal Anti-Inflammatory Drugs (NSAIDs). These medications are prescribed to patients as a treatment for fever, pain and inflammation. This drug is available as capsules, tablets, liquid, cream and lotion. Side effects associated in the intake of salicylates are abdominal pain, ringing in the ears, skin rash, presence of blood in the vomit. For children who are taking this drug, side effects may include drowsiness, behavioral changes and deep or fast breathing [1, 2, 3]. How much is Salicylate Toxicity? There are 2 types of salicylate toxicity: acute toxicity occurs when a toxic amount of salicylate is ingested at one time while chronic toxicity occurs as a result of long-term salicylate therapy. An amount of 125mg/kg serum salicylate level may lead to mild salicylate toxicity. 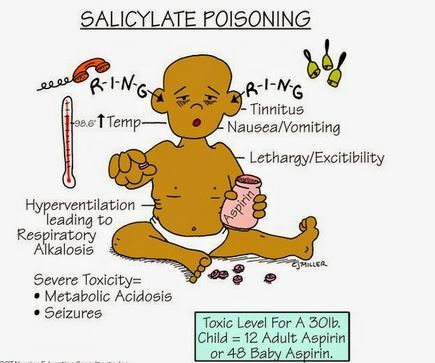 If the level reached to 250mg/kg, a moderate salicylate toxicity will occur and a level of 500mg/kg is a severe toxicity and can even be fatal to the patient. Elderly patients are at a risk for aspirin toxicity because of the reduced capability of their body to clear the drug from their system [1, 2, 3, 4]. What are Salicylate Toxicity symptoms? As can be seen in an acute lithium toxicity, someone who ingested a toxic amount of salicylate may experience nausea and vomiting. After a few hours, symptoms such as seizures, fever, hyperactivity and confusion may manifest. If not managed promptly, the hyperactivity will turn into lethargy. Respiratory failure may also happen at severe levels of toxicity. 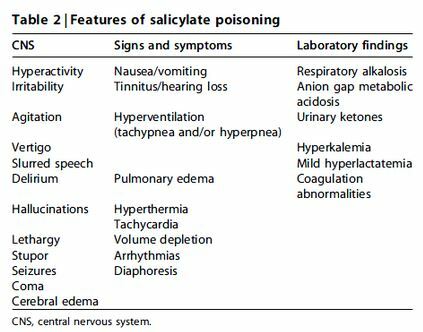 Those that accompany a chronic salicylate toxicity include changes in the mental status, hypoxia, pulmonary edema, lactic acidosis, hypotension and dehydration [1, 2, 3, 4, 5]. What is Salicylate Toxicity management? Based on statistics, majority of the occurrence of salicylate toxicity is due to a suicide attempt. Immediate treatment is necessary in order to avoid any irreversible damage in the organs. The priority in these patients is to stabilize their airway, breathing and circulation. Alterations in their level of consciousness may affect their ability to maintain their breathing, an emergency intubation may be performed if this will be a concern for the patient. The management in order to reduce the amount of salicylate in the system depends on the type of toxicity that occurred. An acute salicylate toxicity will benefit in the administration of activated charcoal especially if the ingestion occurred less than an hour ago. This can be given in multiple doses to reduce the salicylate in the system. Precautions in administering activated charcoal should include protection of the airway to prevent aspiration. The management of those who experienced a chronic salicylate toxicity is more symptom-focused and they may be placed under intensive care. Promoting urinary excretion done in methotrexate toxicity is also applicable in lowering the serum level of salicylates and This is achieved with the administration of isotonic fluids through an intravenous access. Like patients who experienced barbiturate toxicity due to intentional ingestion, these individuals must undergo a psychiatric evaluation to ensure that this won’t occur again in the future [1, 2, 3, 4, 5]. How to prevent Salicylate Toxicity? Prevention of an overdose in salicylates starts in taking the medication according to the prescription of the physician. Those who take these drugs regularly, especially the elderly, should not miss their regular follow-ups to identify any required dose adjustments. Bottles that contain these medications should be properly labeled and kept in secured cupboards to prevent accidental ingestion [1, 2, 3, 4, 5].